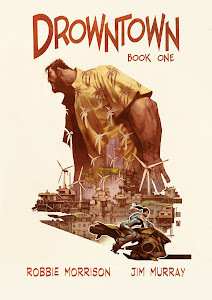 Here are a few Background Notes about the 'world' of Drowntown that we put together for the initial outline of the book, although we had a slightly less snappy working title at that point. War and climatic upheaval have changed the world forever. Europe and the United States have been ravaged by rising sea levels and bio-warfare. London is a flooded metropolis, controlled by corporate, military and political interests. City life has adapted to the rising waters. The tube, the infamous underground rail network, is now a giant, eel-like submersible that navigates the flooded streets and tunnels. Water-taxis modeled on the old black cabs, sleek speedboats and submersible hydro-bikes are the preferred form of transport. Lush vegetation grows upon centuries-old buildings, making many areas seem like lost cities in an equatorial rainforest. The clientele of sub-pubs (submerged pubs) peer out into the sunken streets as if they are in an aquarium. The wealthiest citizens are genetically altered, allowing them to breathe underwater and swim with superhuman skill. The majority of the population is trapped in the Depths, floating slum communities, some of which are even submerged, colonizing abandoned underground stations. Others live nomadic existences traveling the city in scavenger ships. The Thames Barrier has become the Britannia Barrier, holding back destructive tides that could destroy the country. Gigantic aero-generators along the barrier generate power for the city. Corporations virtually rule the world, manipulating governments, and maintaining their own private armies and intelligence services. Subterfuge, sabotage and assassination are de rigueur. Genetic engineering practices, such as those pioneered by the Drakenberg Corporation, have manipulated evolution and transformed the nature of life as we know it today. Many species of animal have been given ‘human’ intelligence and assimilated into regular society as a hybrid underclass. Adventurers and opportunists abound, determined to rise out of the Depths and earn themselves a better life, or die trying. This is looking and sounding raaaather lovely.